The weekend. That oasis at the end of the week. Two days free from work and school. 48 hours to do whatever you want: go out, play sports, hang out, or just veg. Yes, the weekend is beloved by adults and kids alike (unless you’re someone who also works on the weekends, then it’s just another day for you). Doug Langdale decided to take this love and freedom of the weekend and make a show about it. Tish, Tino, Lor and Carver chilling with some Chug-a-Freezes. The Weekenders followed four seventh graders and their adventures from Friday afternoon through Sunday night (and sometimes another weekday, typically Monday, as a story required) in the fictional California town of Bahia Bay. The lead character was the neurotic Tino Tonitini (Jason Marsden), who often served as the show’s on-screen narrator and talked directly to the audience (indicated by the background behind him gaining gray saturation in its coloring). Usually in his company was Lorraine “Lor” McQuarrie (Grey DeLisle), a sports-obsessed tomboy; Carver Descartes (Phil LaMarr), a self-centered fashionista who believed himself cooler than he actually was and had an unhealthy love of sneakers; and Petratishkovna “Tish” Katsufrakis (Kath Soucie), an intellectual that idolized William Shakespeare. Sometimes you just have to do homework. The show had numerous running gags throughout its run: the pizza place the kids hung out at had a different theme every time it’s seen; Lor’s many brothers and her inability to recall exactly how many; Tino’s mother (Lisa Kaplan) serving questionable food-like items; Tino relaying stories about the unseen character Chloe Montez and all her antics; Tish translating for her immigrant mother (Kerri Kenney) when she ultimately mixed up words, followed by her mother affirming “Is what I say”; Tino’s mother’s seeming omniscience about his problems; and a host of others. Sometimes, school would intrude on the weekend in the form of homework or a project due on Monday. 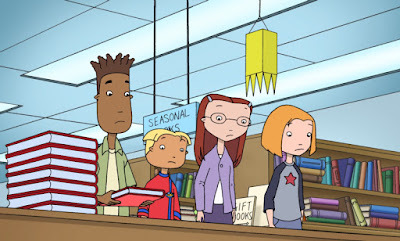 The Weekenders premiered on February 26, 2000 as part of Disney’s One Saturday Morning programming block on ABC. Although it was a cartoon and the kids involved often overdramatized their problems and blew trying to solve them out of proportion, the show was kept fairly grounded as it dealt with issues like getting older; trying to get tickets to see their favorite band, Chum Bukket; being respectful of others’ feelings; dealing with fears; surviving the climb of the social ladder; being true to yourself; and more. Episodes typically featured two story segments, but a few presented a single story. The stories usually ended with Tino (or, occasionally, someone else) summing up the events that transpired to the audience and signing off with a “Later days”. The writing staff included Evan Gore, Heather Lombard, Brian Palermo, David Warick, Peter Gaffney, Steve Atinsky, Dan O’Connor, Rachel Powell and Jonahtan Rosenthal. The cool kids. You totally wanna be like them, right? The series’ theme was written by Wayne Brady and Roger Neill and performed by Brady. Neill handled the rest of the series’ music. Ginny Hawes and Steven Lyons served as the lead character designers. A unique decision was made to give the characters an actual wardrobe, which meant that in every episode they typically wore something different unlike normal characters who could go entire series in the same outfit. Lyons also directed every episode, which was fluidly animated by Wang Film Productions. 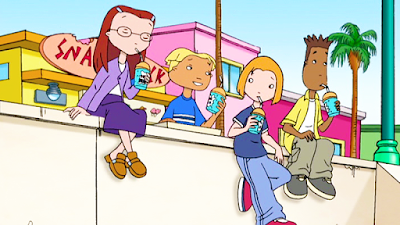 The Weekenders ran for three seasons on ABC, as well as in syndicated reruns on Sundays on UPN’s Disney’s One Two programming block. The show was well-received, at one point beating out Pokemon, its direct competitor, in the ratings. In 2001, it ended its initial run and was replaced by an expanded hour of Recess. It began airing on Toon Disney in reruns, and it was there an abbreviated fourth and final season aired from 2002-04. 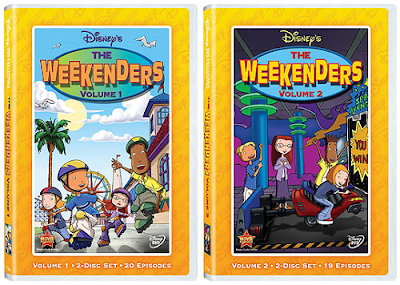 In 2013, Disney made the complete series available on DVD in two volumes through the Disney Movie Club. It became the first show by Walt Disney Television Animation and from One Saturday Morning to be completely released to DVD. It was also one of Disney’s shortest, clocking in at 39 episodes whereas most Disney programs tended to run until they reached 65. “Crush Test Dummies / Grow Up” (2/26/00) – Carver thinks Lor has a crush on him. / Getting caught in a bouncy house has Tino vow to become more mature. “Shoes of Destiny / Sense and Sensitivity” (3/4/00) – Carver gets new shoes so that he can stand with the cool kids on picture day. / Lor tries to be nice to make up for disappointing her friends. “The Perfect Weekend / Throwing Carver” (3/11/00) – Tino’s friends bail on his plans for the perfect weekend. / Tish’s friends try to spare her feelings when she makes an ugly statue of Carver. “Home@work / To Be or Not to Be” (3/18/00) – Lor needs help passing a test or she’ll get sent to military school. / Tish stops hanging out with her friends when they make fun of Shakespeare. “Sitters / Band” (3/25/00) – Carver has to babysit his little brother. / Carver tells a lie that Chum Bukket will dedicate their next show to him and his friends. “Makeover / The New Girl” (4/1/00) – Two girls give Lor a makeover when she’s asked out by Thompson. / Tish’s mom hangs out with her friends to try and become Americanized. “Party Planning / Pudding Ball” (4/22/00) – The gang gets invited to a clownless party. / A pudding throwing contest brings out the worst in the gang. “Dead Ringer / Carver the Terrible” (5/6/00) – Tino tries to look cool playing horseshoes. / Carver’s perceived as a bully when he’s seen tripping Laird. “Radio Drama / The Tradition” (9/9/00) – A radio contest makes Tish bossy. / Tish must study for a coming-of-age ceremony. “To Each His Own / The Invited” (9/16/00) – Everyone wants to do something that only they like to do. / Tino and Tish get ready for a costume party Carver and Lor weren’t invited to. “Diary / Real Fake” (9/23/00) – After accidentally reading her diary, the gang thinks Tish is moving. / The gang adopts TV character personalities when they think they’re too boring to be on film. “Super Kids / Crevasse of Dreams” (11/4/00) – A seminar has the gang trying to do something meaningful with their weekends. / Tino is the only one who remembers a great hangout spot. 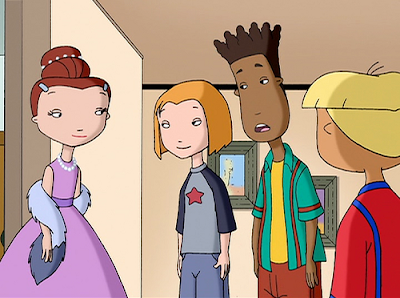 “Dixon” (11/11/00) – While the gang concerns themselves with getting tickets to an amusement park reopening, Tino worries about his mother’s upcoming date. “Taking Sides / To Tish” (1/13/01) – Tino and Carver’s fight splits the group in half. / Tish is annoyed when her name becomes a slang term. “Tickets / Vengeance” (1/27/01) – Tino has a hard time deciding which friend to take to the Chum Buckket concert with his extra ticket. / Carver seeks revenge when a girl tricks him at school. “Murph / Uncool World” (2/3/01) – Tino worries that nobody likes him. / The gang helps one of the cool kids get used to being uncool. “My Punky Valentine / Brain Envy” (2/10/01) – The gang tries to get Tino over his crush on a punk girl. / Lor gets jealous when her crush pays attention to Tish. “Tish’s Hair / I Want to Be Alone!” (2/17/01) – The gang doesn’t want to tell Tish her new haircut is ugly. / Tish wants to spend the weekend alone and the gang wants to uncover why. “Baskets for Bucks / Pru” (3/3/01) – Lor needs to sink three baskets to win money, and if she fails she fears she’ll lose her friends. / A popular girl makes the gang popular to get back at her friends. “Talent Show / Relative Boredom” (3/10/01) – Lor tries out for the talent show. / Tino’s cousin is visiting when he planned to see Chum Bukket. 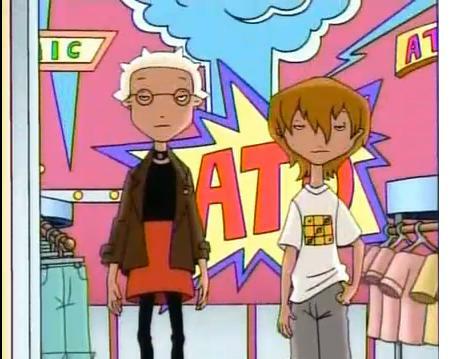 “New Friends / The Awful Weekend” (3/17/01) – After meeting his mom’s former best friend, Tino believes his friendships will end badly. / The gang experiences a terrible weekend. “Crushin’ Roulette / Lucky Shoes” (9/9/01) – Tish feels left out not having a crush. / Carver loses his lucky shoes and his confidence. “Cry / The Perfect Son” (9/16/01) – Tino vows to give up emotions after being teased for crying during Romeo and Juliet. / Carver gets jealous when it seems like his parents like Tino better. “Listen Up / Never Say Diorama” (9/23/01) – Carver has trouble with their volunteer work to help kids transition to middle school. / Tish and Tino help Lor and Carver finish their diorama. “Secret Admirer / The Lone Wolves Club” (9/30/01) – Carver tries to find out who his secret admirer is. / Tino gets invited to join a super-secret club. “The Most Dangerous Weekend / Charity Case” (10/7/01) – After he gets hurt, Tino becomes overly cautious and paranoid. / Tish convinces the gang to help out a girl that seems to be unpopular. “Best / Broken” (10/14/01) – Tino tries to get labeled “Best” in the yearbook. / Tino worries how he’ll be perceived if he reminds Carver to fix the scooter he broke. “Father’s Day / Follow the Leader” (10/21/01) – Tino wonders what to do for Father’s Day since his doesn’t live with him. / Unable to decide what to do, the group lets just one friend decide for them all. “Careers / Tutor” (10/28/01) – The group ponders their career test results. / Lor needs a tutor to help save her grades. “The Tao of Bluke / An Experimental Weekend” (11/4/01) – The group engages in a team challenge. / Tish wants to win a psychology prize. “Celebrity” (11/11/01) – Carver teaches Tish how to act like a celebrity after she appears on TV. “Clown / Testing Dixon” (11/18/01) – Tino tries to get over his coulrophobia. / Tino wants to test Dixon to see if he’d be a good stepfather. “Croquembouche / Imperfection” (11/25/01) – The gang goes to a food festival. / Tish tries to stop being such a perfectionist. “The Worst Holiday Ever” (12/2/01) – The gang heads to Lor’s grandmother’s farm for the holidays, but their RV gets stuck in a blizzard. “Nevermore” (10/19/02) – Tino wants revenge when his friends think they’re “too old” to go trick-or-treating. “Brain Dead / Lor’s Will” (11/7/03) – Tish gets a B on a test. / Believing her injury to be fatal, Lor writes a will—and leaves Tish out. “Radio Free Carver / Dinner Party” (11/14/03) – Carver’s turn as a DJ ends in disaster. / Tish “invites” her friends and Bluke to a salon party. “Laundry Day / Penny McQuarrie” (11/21/03) – Lor gets her friends to help with her family’s laundry. / Carver and Lor get involved when their siblings start dating. “Tino’s Dad” (2/29/04) – Tino plans the perfect weekend to bond with his dad, who finally comes for a visit.